With its bright neon orange finish, the LTD M-50FR immediately catches the eye. With two ESP Designed LH-150 humbuckers the LTD M-50FR delivers fat sounds, the LTD by Floyd Rose can also handle Divebombs without detuning. 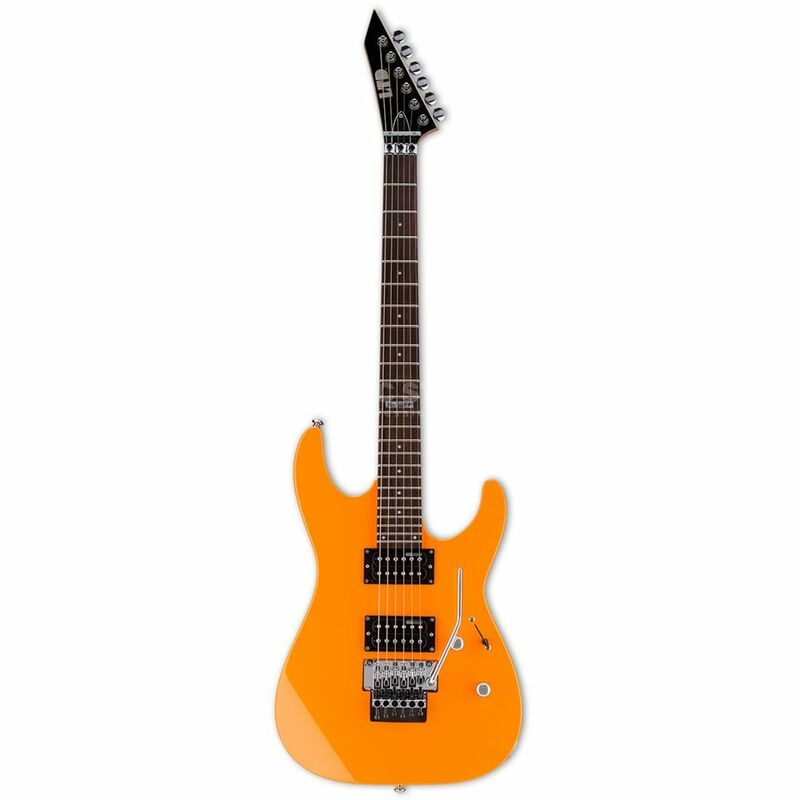 With the LTD M-50FR in bright neon orange, the Japanese heavy metal band ESP presents the ideal entry-level guitar for the next generation of metal players, but advanced players will also enjoy the excellent workmanship and the rich sound. Equipped with two ESP Designed LH-150 humbuckers, the LTD M-50FR delivers hot metal sounds with a firm bass foundation, present mids and biting high-frequency riffs with juicy precision and solos. But the ESP units can also convince on the clean amplifier, where they let chords and melodies bubble out of the loudspeakers with harmonious airiness. The fast neck with flat "Thin U" profile lies comfortably in the hand and offers even beginners a perfect basis for fatigue-free play. Thanks to the wide cutaways and the ergonomically designed fretboard, the high positions of the two octaves can also be reached unhindered. The ESP LTD M-50FR uses a licensed Floyd Rose Double Locking Tremolo as a bridge, which can withstand even the most violent dive bombs and aggressive whammy sounds without complaint and without detuning. In addition, the M-50FR is equipped with high-quality LTD die-casting mechanisms.